We just got done talking to Sprint about their latest (and some would say best) music phone, the Samsung Upstage. Here are some previously unreleased details that may have not been found here (or anywhere else). • It's cheap: Only $149 with contract. That's way low for a music phone with this kind of featureset. • Unfortunately, the Upstage won't play any other form of DRM (the songs from Sprint aren't DRMEd, actually, which is nice). So your iTunes, Zune, Napster, and other form of DRMed music won't be able to be played on this. • It comes with 64MB built-in memory, but will accept 1 and 2GB flash cards. Jump for some more bullets, and a shocker! • The Upstage will not be able to use music you've downloaded from their 1.4 million track repository for MP3 ringtones. 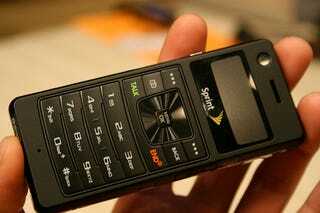 In fact, from what Sprint said, you can't use MP3 ringtones at all. Ouch. We blame the RIAA for this inability to use music as a ringtone in a music phone. • You can download tracks both over the air (OTA) or on your PC, and the service will remember which tracks you've downloaded. • The OTA versions are more compressed than the ones from the PC—which has standard MP3 compression—so if you wanted to, you could download a higher quality version of the song later for free (see above bullet). • You can use the phone in USB Disk mode along with their own proprietary music manager service. • Head to sprint.com/upstage to sign up for their 4/1 launch. And finally, when we asked Sprint how this compares to the upcoming iPhone (since they are both music-centric phones), Sprint gave us four ways in which they're different. Here they are, in bullet point form. • It has OTA music downloads. • The touchscreen feature on the iPhone will be hard to use for the majority of users.